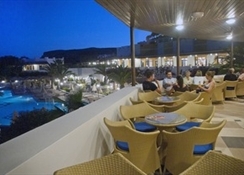 Lagas Aegean Village is located on a seashore with all the rooms built hilltop to allow a beautiful view of Aegean Sea.The hotel offers all-inclusive, half-board and full-board accommodations to all kinds of guests. All guestrooms are decorated with modern furnishings and smooth colours with balcony or terrace overlooking sea or garden and are divided into standard double/twin rooms, family rooms, junior suites and handicapped rooms. All rooms come with amenities such as double or twin beds, extra bed on request, air conditioning, satellite television, free access to WiFi in public areas and paid access in rooms, in-room safety box, refrigerator, hairdryer, private bathroom, etc. Standard double or twin room can accommodate up to 3 guests, family rooms are suitable for a maximum of 4 guests including children, junior suites can accommodate 4 guests while handicapped rooms are apt for 2 guests at max. 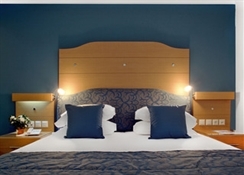 The hotel serves a rich continental breakfast at its buffet restaurant – something for every palate. The dinner is full of international and local Greek cuisines, including chef’s special desserts and ice creams. Lunch is at the poolside snack bar which is an assortment of food including, pizzas, salads, gyros with tzatziki or mousaka. Drinks are served in an evening bar, poolside bar and disco bar. Beverages served in these bars range from delicious cocktails to chilled, refreshing beers, rich and fragrant coffee and fresh juices. Additionally, there are cafes and bars available in neighbourhood where you can taste local as well as special cuisines. Recreational activities include a huge outdoor swimming pool with sunbeds and parasols, four floodlit tennis courts, multi-court, water polo, darts, volleyball, table tennis, billiards, fitness centre with modern machines, etc. There are themed nights with traditional dance and music played live, while the mini-club and mini-disco keep the youngsters busy and entertained. A playground is also available for kids. However, you can enjoy loads of water sports on the beach.There is a mini-market on site along with a boutique and jewellery shop. This hotel is around 8 km away from Kos international airport. 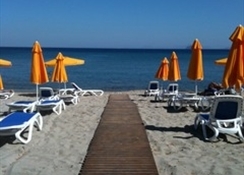 The beautiful town of Kos is located about 30 km. The hotel runs a shuttle service 24/7 to and from Kos. You can find a lot of activities in Kos. Shopping, water sports, stunning beaches with taverns to enjoy a drink watching sun setting behind Aegean is a sight to admire.Take a look at shops displaying jewellery and pottery in both modern as well as old, classic designs in Eleftherias Square. Head up to Kardamena for some adventures like trail riding, horseback riding, etc. Kos is a lively town with many taverns, bars, nightclubs in vicinity.